In the constant bustle of New York City, it can be hard for residents to find a serene place to clear their minds. Many take trips to the countryside upstate, to the beaches on Long Island, and to neighboring states – but there is an escape that can be found without leaving Queens: horseback riding. Lynne’s Riding Academy, located at 8803 70th Road in Forest Hills, offers English riding lessons in its 80-foot ring. After riders take enough lessons to be comfortable with the unpredictable, but exciting situations horses can pose, they are offered lessons outside in Forest Park. 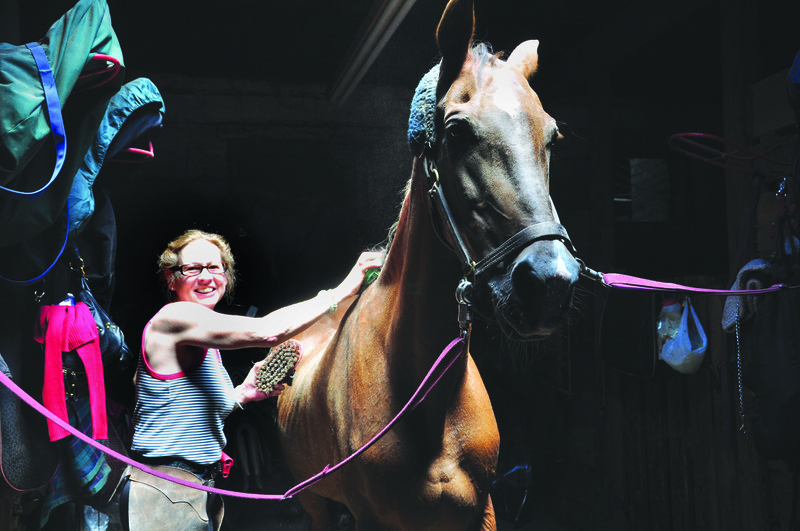 Katie Raszewski, a 28-year-old Jackson Heights resident who has ridden at Lynne’s for 2 ½ years and now is a volunteer at the barn, said the facility offers a way for fast-paced city slickers to take a break. “It’s amazing that [Lynne’s] is in Queens because you don’t have to travel,” Raszewski said.“You’re in the middle of the city but it’s very quiet and you don’t feel like you’re there. It is necessary for riders to forget about their lives outside of the barn so they can focus on their communication with the horse, she said. As for a favorite horse, Raszewski said she couldn’t decide which one to pick. Lynne Holzhauser, the barn’s owner, inherited the stable from her father, who owned it for decades prior, Raszewski said. The barn offers lessons and boarding. It currently has 26 horses including boarders, she said. She said Holzhauser is the reason why people prefer ride at her academy instead of the few others that exist in the five boroughs. Prices range from $45 for a 30-minute private lesson, $70 for an hour, or $45 for an hour group lesson. However, Raszewski said Holzhauser makes sure her students can handle horses in a group setting, where they tend to be less well behaved, before they can ride in a group lesson. She said there are about seven instructors at the barn total, including Holzhauser. The stable offers lesson packages, such as five 30-minute private lessons for $214 and five 45-minute private lessons for $285. It also hosts birthday parties and pony rides. Lynne’s also offers therapeutic riding lessons for people with emotional and physical disabilities, veterans returning from war, first responders and others with special needs through GallopNYC, a citywide program. For more information, visit Lynnesridingschoolnyc.com or, for the therapeutic riding program, Gallopnyc.org. Posted by admin on Nov 4 2011. Filed under Entertainment, Featured Articles, Main Story. You can follow any responses to this entry through the RSS 2.0. Responses are currently closed, but you can trackback from your own site.